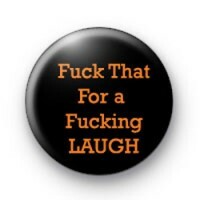 F*Ck that for a F*Cking laugh badge in black with orange text. One of our popular adult slogan badges, these badges are always popular with university students & are a pop culture classic. We have a range of rude & offensive badges on the website, not to mention funny slogan badges and adult-themed badge, so have a browse and start decorating your backpack or jacket. Our badges are 25mm (1 inch) button badges and are made by hand in our family workshop. Free delivery available on larger orders.